Screen shot showing how I have MixW configured using NAVIGATOR Interface. 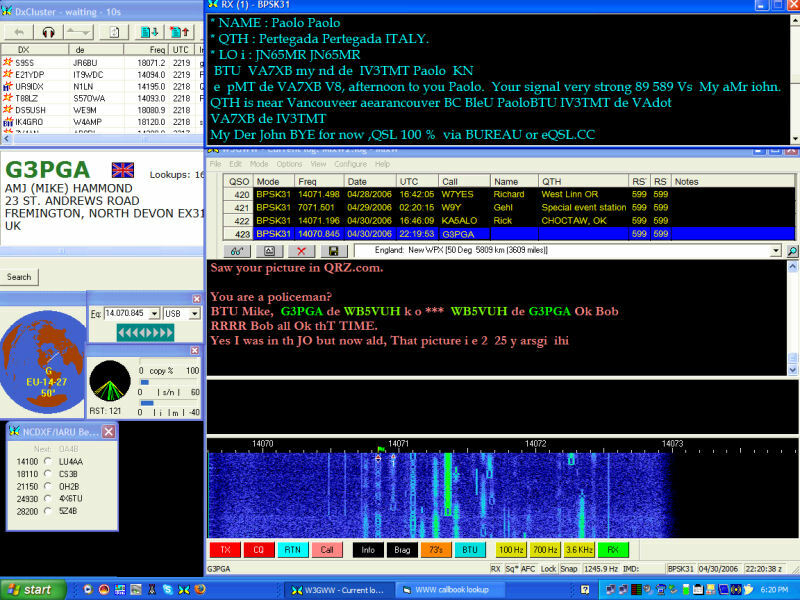 Left side top-bottom: DxCluster, MixWeb Lookup, Beam Heading, CAT Bar, Tuning Indicator and Beacon Monitor. to my personal preference. This Macro setup can be used with any Icom using IF Digital filters like the 746Pro, 756Pro (all models), 7000 and 7800 series transceivers. The ‘Align’ Macro is essential as it sets the received signal into your filter’s passband center. The Digital Mode On and the Align command can’t be seen here as they both are embedded within the bandwidth filter Macros. NOTE: The ALIGN Macro alone can ALSO be used with the IC-706, IC-703 and IC-718 to use the Bandpass Tuning on your transceiver to reject adjacent QRM either up or down the frequency from you. Works nice with these rigs.